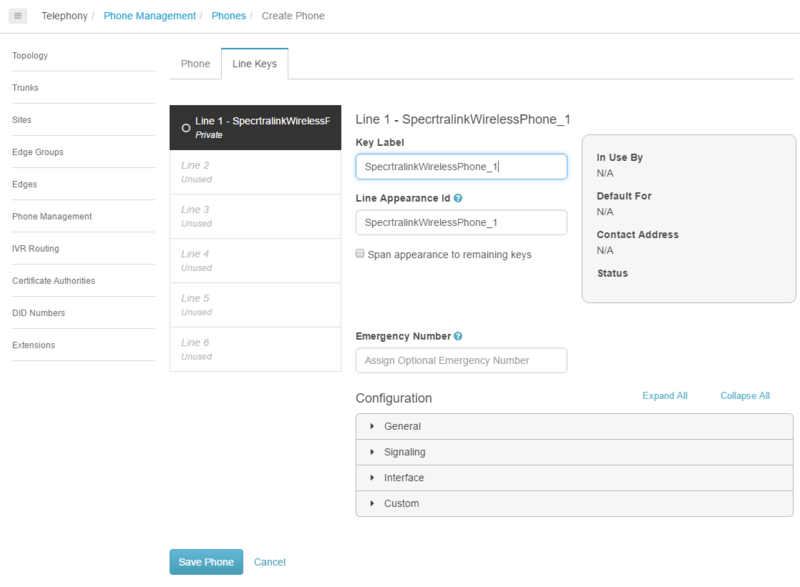 Once you have created an Spectralink wireless phone base settings profile you can create the phone profile. This profile contains a group of settings found on the Phone and Line Keys tabs that define the phone in PureCloud. The majority of the settings on the Phone and Line Keys tabs are inherited from the base settings. However, you can customize the phone by altering any of the settings that it inherited from the base settings configuration-without effecting the original base settings configuration. See Inherited settings. Click Create New and the Phone tab appears. Type a name in the Phone Name field. From the Base Settings list, select the Spectralink wireless phone base settings profile you want. From the Site list, select your Site. Type the phone’s MAC address in the Hardware ID field. To use the default phone configuration settings, click Save Phone and proceed to the Configure the line keys section of this article. In the Phone Configuration panel, click the arrow to expand the section containing the settings you wish to customize. This is the administrative password that you use when configuring the phone from the Web interface. By default the password is masked, but you can select the Show Password check box to see the password in plain-text. GMT のオフセット Use this field to set the number of hours to offset the time of the phone from GMT. SNTP サーバー Sets the name of the Simple Network Time Protocol (SNTP) server from which the phone obtains the current time. Specify the payload type value to use when the DTMF Method type is set to RTP Events. Valid range is 96-127. Edge を使用する Use the Edge to obtain provisioning information. Use the following URI URL that the phone uses to obtain configuration information (provisioning). If this parameter is not present, the phone uses DHCP INFORM to determine where to get its provision data. TLS 認証 ID Specify the file path to the trusted authorities directory on the disk used for TLS. Disabled (default): Disables Do Not Disturb (DND) synchronization between Edge and the phone. Major error: The tracing shows those errors that will eventually incapacitate the system. Minor error: The tracing shows only those errors from which the system will recover gracefully. Debug: This is the highest level of tracing available. The Custom option is designed to allow PureCloud Customer Care personnel to alter a phone configuration for troubleshooting or special circumstances. You should only enter custom property settings as directed by PureCloud Customer Care. 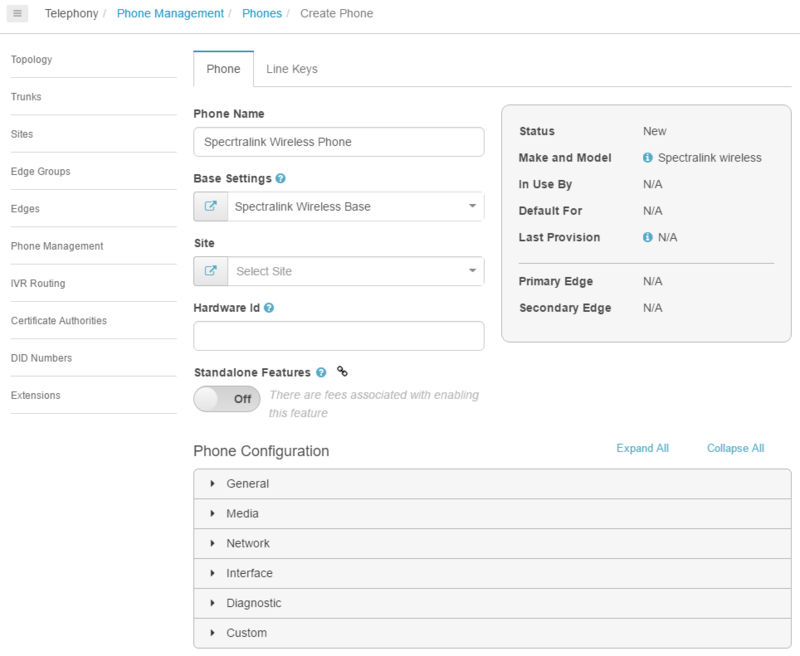 To use your custom phone configuration settings, click Save Phone and proceed to the Configure the line keys section of this article. Click the Line Keys tab. Type a name in the Key Label field. Type a name in the Line Appearance Id field. If you want to specify a callback number to be sent when a call is made to an emergency service, type that number in the Emergency Number field. To use the default line keys settings, click Save Phone. To customize the line keys settings, proceed to the Customize the line keys section of this article. In the Configuration panel, click the arrow to expand the section containing the settings you wish to customize. パスワード The password pushed down to the phone that changes the password on the administrative account for the physical phone menus. By default the password is masked, but you can select the Show Password check box to see the password in plain-text. To use your custom line key settings and complete the Spectralink wireless configuration procedure, click Save Phone.